Early kick off today so just time for a quick beans on marmite toast before the match. We deserved the 0-0 draw that we seemed destined for, but Man U scored 6 minutes from the end and there was no coming back from that. 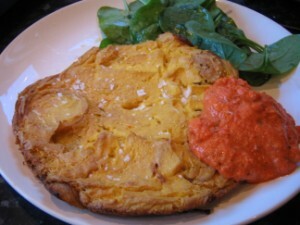 When I got in I decide to make myself the Revolutionary Spanish Omelette with Red Pepper Sauce from VWAV. It’s based on tofu. I can’t find soft tofu here but I used firm and just needed a little extra rice milk. It also has onions and potatoes in it. It’s delicious but I find it needs a bit of extra salt and I drizzled a little chilli oil over it too. Yum. This entry was posted in VWAV by efcliz. Bookmark the permalink.